These cooking events hosted by so many bloggers has its advantages and disadvantages. Advantages are that you get to share recipes, learn about new recipes other bloggers are making and at the same time get a wider audience for the blog. The disadvantage is mainly for me and that is, I can’t stop thinking of recipes with potatoes, eggless and yellow. This sort of blocks your brains into not being able to see other ingredients. After sending my moong dal dokhras for the yellow event and empanadas for the eggless event, I spent quite a bit of time browsing through my recipe book for a new recipe which I could enter for the yellow and eggless event. Found the recipe for lemon poppy seed muffins and crossed the road to Nakumatt to get the poppy seeds. I am glad my obsession worked out to my advantage. The muffins are so fresh, lemony and nutty. The poppy seeds add a subtle nutty flavour. I also love that they are made from wholemeal flour and not plain flour. The muffins tasted more lemony the next day. I think this will be a recipe that I will be making again and again. Preheat the oven to 180°C. Grease the muffin tray or cups or put a paper cup into them. Sieve the flour, baking powder, baking soda and salt together. Add the lemon zest and poppy seeds to it and mix. In another bowl whisk the milk, oil, lemon juice, sugar, vinegar and maple syrup till it is frothy. Add the liquid to the flour and fold till the flour is all wet. Do not over mix. Spoon the batter into the prepared cups. Fill it three quarter of the way. Sprinkle the brown sugar scantily over the top of the batter. Bake the muffins for 20 to 25 minutes till the tops are golden brown and done. Insert a toothpick into the middle of a muffin. If it comes out clean then the muffins are done. Remove the muffins from the oven and the tray. Let them cool on a wire rack. 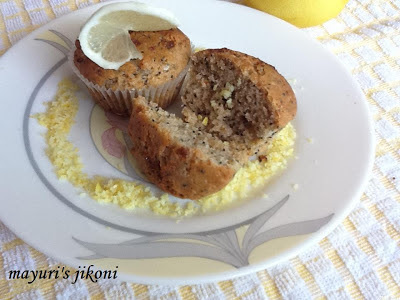 When you grate the lemon, make sure you do not grate the white part otherwise the muffins may turn out a bit bitter. If you like you can use ½ cup of sugar instead of a ⅓. I found using ½ a bit sweet. If you like, frost the muffins with a frosting. Add lemon zest to the frosting. yum yum yummy!!! Thanks for linking it to my event!! Looking for more yummy recipes! !